Dr. Brown’s area of focus is on hypertension in African Americans, and the role of exercise as a preventive and treatment strategy for hypertension. When Brown found that on the larger competitive stage he was a middle-of-the-pack sprinter, his focus shifted toward academics. 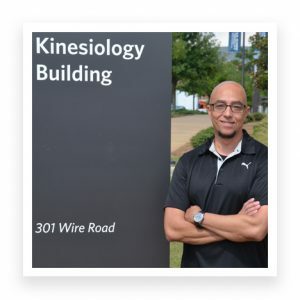 One of Brown’s Kinesiology colleagues, and a researcher he has long admired, is Bruce Gladden, director of the Muscle Physiology Lab in the School of Kinesiology. Brown’s work focuses on cells in the blood vessels, and his research includes both human and cell models. But Brown’s vision goes beyond basic bench science. He sees inequities not just in people and their health, but also in who does the research. Brown emphasized that the School of Kinesiology is very supportive of those efforts, and he cites colleague Jared Russell’s successful efforts to recruit underrepresented researchers to Auburn’s campus through his Future Scholars Summer Research Bridge Program. On the positive side, Brown, a prolific grant writer, said the National Institutes of Health may be peaking on treatment grants, and is now turning more and more toward prevention.